For a life of dignity, freedom and fraternity, we’re in the squares on May Day! May Day is the day of Unity, Struggle and Solidarity for the Working Class. It is the day for workers the world over to join hands and march shoulder to shoulder; it is the time to shout the desire for a life of dignity, freedom and fraternity in the squares of May Day. 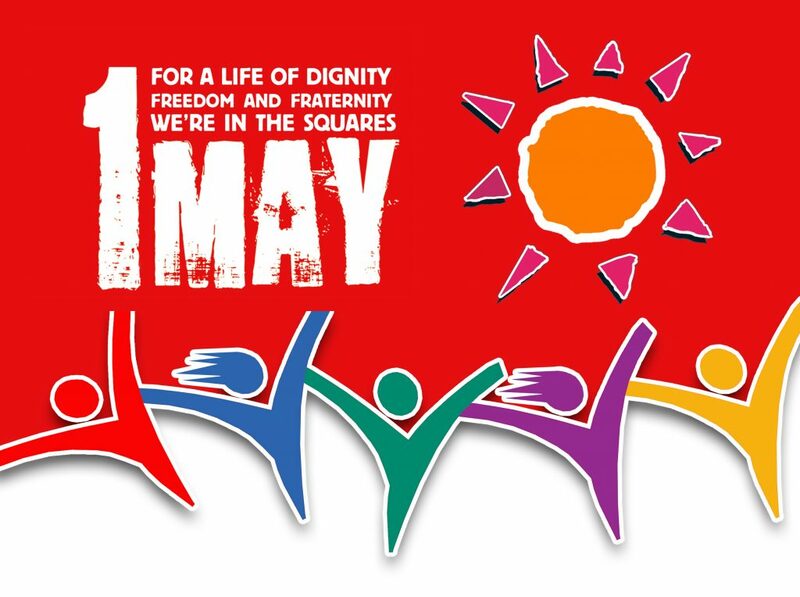 Like workers everywhere, we, the working class of Turkey, will again pour into the squares for May Day in 2016 to express our demands and hopes for humanity, freedom and fraternity. We are raising our voice against working conditions that leave us vulnerable. We don’t want to be slaves for subcontractors and the Private Employment Offices that are slated to replace them. As workers, we are heading to the squares to stand against the trade in humans and de facto slavery that violates human dignity. FOR A LIFE OF DIGNITY AND STABLE WORK, WE ARE IN THE SQUARES ON MAY DAY! Workers in Turkey are already some of the most vulnerable in the world, we reject the government’s plan for “stable flexibility,” which will only further increase our employment vulnerability. As such, we will raise our voice against those who deign to eliminate our right to severance, which protects the jobs of millions of workers. WE’RE IN THE SQUARES ON MAY DAY TO PROTECT THE SECURITY OF OUR JOBS AND OUR RIGHT TO SEVERANCE! We reject the imposition of working conditions devoid of job security in place of subcontracted slavery. We want election promises regarding secure employment to be kept and court decisions to be implemented. WE’RE IN THE SQUARES ON MAY DAY TO DEMAND THAT PERMANENT AND SECURE EMPLOYMENT IS EXTENDED TO ALL SUBCONTRACTED WORKERS WITHOUT RESERVATIONS! With the current minimum wage condemning workers to a life below the hunger line, we demand a minimum wage of at least 1,900 TL to guarantee a life of dignity. Moreover, we demand that all wages be raised by at least 300 TL. WE’RE IN THE SQUARES ON MAY DAY FOR A WAGE THAT GUARANTEES A LIFE OF DIGNITY! In the past 13 years, the number of billionaires in Turkey has grown 14 times; in contrast, the share of labor in the national income has fallen from 40 to 30%, meaning Turkey now has the greatest income inequality in Europe. As the multitudes who are condemned to live with poverty and debts as a select few enjoy increased wealth and new palaces, WE ARE IN THE SQUARES ON MAY DAY FOR A JUST DISTRIBUTION OF INCOME! Some 1,730 workers died on the job in 2015. We are standing against those who see workers’ health and work safety as an irritant and against an order that sacrifices lives in the pursuit of profits. WE’RE IN THE SQUARES ON MAY DAY TO PREVENT DEATHS, INJURIES AND ILLNESSES ON THE JOB! We don’t want to see our rights to unionization and strikes trampled underfoot. We demand an end to thresholds for unionization and other prohibitions that were implemented after the 1980 coup and supported by the current government. We say that a referendum at a workplace is enough to conduct collective bargaining. We are standing against a labor system in which employers and the state determine which union we can join. We’re taking to the streets to eliminate anti-democratic prohibitions on strikes. WE’RE IN THE SQUARES ON MAY DAY FOR OUR RIGHT TO ORGANIZATION, COLLECTIVE BARGAINING AND STRIKES! Compared with the rest of the world, workers in Turkey enjoy some of the shortest vacation time while also being forced to work the longest hours, even if one is sick. In a country in which the jobless rate has hit 18%, millions more could be given work if working hours were reduced. WE’RE IN THE SQUARES ON MAY DAY TO DEMAND A REDUCTION OF THE WORK WEEK TO 37.5 HOURS – WITH NO REDUCTION IN PAY – AND ONE MONTH OF PAID VACATION A YEAR. We’re raising our voice against those that would exclude women from the labor force and society by saying “women belong in the home” and those that would force women to work half-time, from home and for a reduced wage. AS WOMEN WHO ARE FIGHTING FOR STABLE EMPLOYMENT, WE’RE IN THE SQUARES ON MAY DAY. At a time when capital and bosses are attempting to make our labor more inexpensive, this system of greed is destroying nature and our cities. To protect our homes, parks, forests and streams against destruction in the pursuit of more profits and more rent, WE ARE IN THE SQUARES ON MAY DAY TO DEFEND OUR LIVING SPACES AND NATURE! May Days in Turkey have always represented a threat to the powers that be. Commemorating our comrades that have lost their lives on May Day, especially when 36 workers were murdered in Taksim on 1977, is a duty and right for all workers in Turkey. 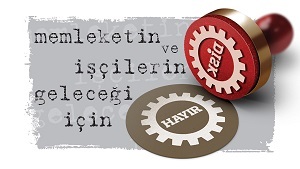 1 May Unity, Struggle and Solidarity Day was declared as a national holiday as a result of the organized and determined struggle of the working class, especially DİSK. To stop those that would roll back the working class’ gains, particularly in Taksim, WE ARE IN THE SQUARES ON MAY DAY TO SAFEGUARD OUR HISTORY! The policies or war and destruction followed by capital and the government are continuing apace against the working class and all our people. The working class requires peace and fraternity. After all, it is the children of workers and the poor that die in wars. After all, during times of war, resources are allocated not to bread and work, but weapons. After all, it is members of the working class that are forced to become enemies of one another in wars. When there is no peace or fraternity, the working class is divided. When there is no unity in the working class, it is capital that wins. WE’RE IN THE SQUARES ON MAY DAY TO PROCLAIM “PEACE AT HOME, PEACE IN THE WORLD” AND TO FOSTER THE UNITY OF WORKERS AND THE FRATERNITY OF PEOPLES! Turkey is a country in which even the crumbs of democracy have been trampled underfoot, in which the right to organization, assembly and strikes, as well as freedom of thought and expression, has been trampled underfoot. Today, taking the squares means fighting for democracy against a government that has imposed oppressive, authoritarian, sectarian, imperialist and fascist policies. We are standing against a system in which only those in power, the bosses and capital are safe, in which only the safety of the government, not people, is guaranteed and in which the country has been turned into an open prison. WE’RE IN THE SQUARES ON MAY DAY TO PROTECT OUR DEMOCRATIC RIGHTS! Turkey is a country in which poverty and death walk freely while journalists, intellectuals, academics, lawyers, opposition figures and individuals seeking their rights are prosecuted, instead of thieves and murderers. WE’RE IN THE SQUARES ON MAY DAY FOR TRUE JUSTICE AGAINST LAWLESSNESS! As it is dragged inexorably toward destruction, our country needs the transformative, unifying and revolutionary power of the working class. As the creators of all that is wonderful in the world, WE’RE IN THE SQUARES ON MAY DAY TO DECLARE THAT WE WORKERS WILL BUILD A COUNTRY OF LABOR, PEACE AND DEMOCRACY!